I just noticed, a bit late, that the parent company of the Arlington Sun Gazette has agreed to be sold. I don’t know if the new owners intend to take an active hand in things, but if they’re looking for suggestions, they should start by replacing the current editorial board. As I’ve noted before, they’re an embarrassment to Arlington. Is it absurd enough, yet? 2) we can sharpen our pitchforks, light our torches, and start looking for witches. Any bets on which way it’ll go? Thankfully, this will not be my mode of travel (tho’ it might feel like it, in those American Airlines seats in the back of the bus . . .). What is my contribution accomplishing, again? About 600 professional consultants were paid more than a combined $1.85 billion in the 2003-2004 federal campaigns. Media consultants, who offer political and strategic advice and handle political advertising, were paid $1.2 billion, or 65 percent of all consultant spending. Direct mail consultants billed the second-largest amount, $298 million, totaling 16 percent of all consultant spending. Consultants routinely pitch campaign plans that rely heavily on their own specialty because there is a financial incentive to do so. Fundraising consultants, whose services are necessitated in large part by the rising amounts campaigns spend on other consultants, cost candidates at least $59 million. When it comes to political contributions and the progressive movement, the flow of money is almost entirely one-way. To the tune of hundreds of millions of dollars, it is sucked out of the movement, and pocketed by the establishment. It’s something we should all keep in mind, the next time we’re asked for a contribution. This magazine cover caught my eye, today. 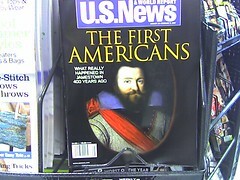 It’s a story on the 400 year anniversary of Jamestown that is curiously titled “The First Americans.” Is U.S. News & World Report telling us that there was no one living in North America before 1607? It’s a very strange choice of title, indeed. 10 or more days per month. an employee tax credit of $15 per month for commuting by bicycle at least ten days in any given month. racks), and to include employee clothes changing and storage facilities as well as employee showers. Finance Subcommittee #3 on Wednesday, Jan. 24 and by the full Finance Committee as early as Monday, Jan.
29. A favorable fiscal impact statement has already been issued by the Virginia Department of Taxation. Ask your Virginia delegate to co-patron HB 1826 before the bill is heard by the full House Finance Committee. You can identify and contact your delegate here. Ask your delegate to vote for HB 1826 at every opportunity. If your delegate (or a nearby delegate) is on the House Finance Committee and/or on Finance Subcommittee #3 ask them NOW to vote for HB 1826 when it comes before Subcommittee #1 (on Jan. 24) and the full House Finance Committee (possibly on Jan. 29). Do not even dream of touching Ray Davis. Please find some space for Farai Cheideya. I don’t care what you do with Tavis. Do not be tempted by Prairie Home Companion. Note to DCRTV: I’d really like to link you for posts like this, but your site structure is atrocious. It’s a shame, considering how easy it is to fix that, and how valuable your content generally is. Last year I waited entirely too long to actually take a look at all the regional and sport calendars or put some thought into what I really wanted to accomplish. So over the past couple of weeks, I’ve put together calender to help me and a few friends figure out what we wanted to do this year. As I look at it, though, I realize that it might be useful to other people in the region. So I’m throwing it up here. This listing is not at all comprehensive – it’s just a list of DC area cycling or amateur athletic events that I either want to participate in or go just go watch. If you’re in the DC area, I hope that you’ll give it a read and see if something catches your interest, either as a competitor or spectator. A fair number of the events listed book up pretty quickly, and lots of them seem to open for registration on January 22. Just FYI, it’s a list that makes me seem far more ambitious or in shape than I really am. I won’t be a competitive threat to anyone in any of these events. Except, perhaps, for the Lanterne Rouge. I just aim to finish and have fun. The calendar is broken down into events for which the date has been set, and events for which the date has yet to be announced. Also, if you’re reading this any day but January 22, 2007, please note that this information could be out of date. What a difference an election makes . . .
I’m still getting used to not cringing when I hear the voice on the radio start a story with “The House voted to . . .” or “Senate leaders are . . .” Been down so long, I’m still not used to up. And it doesn’t stop there. In the Senate, I’ve gone from having two Iraq war cheerleaders to two Senators who publicly oppose Bush’s Iraq plans. Now, I expect much more than this from my representatives, but this is a damn good start . . . Remember, the primaries are less than a year away. And what a year it will be. It’ll be non-stop bashing of blacks, women, Muslims, trial lawyers, and brown people south of the border. And the GOP’s hatred for anyone who isn’t a privileged (by birth) white male will be in full display. With Iraq burning out of control, the GOP senses its imminent 2008 disaster. It’s a cornered, wounded animal with little chance of escape. And those are the most dangerous of all. What prompted this? Oh, just some harmless little speculation on Fox about Barack Obama’s being schooled by terrorists . . .